This cake is so good, it reminds me of pastry I ate in Rome. Sanding sugar gives this cake a crunchy top and keeps the inside moist. Preheat oven to 375 degrees. Brush bottom and sides of an 8-inch round cake pan with olive oil. Line the bottom with a round of parchment paper and brush paper with the oil. In a food processor process together oil, eggs, 1 cup sugar, and wine until smooth. Add cornmeal, baking powder, salt, and orange zest and process. Add flour and pulse until just combined.Pour batter into the cake pan and sprinkle top evenly with 1/3 cup sanding sugar. Bake for 35 to 40 minutes until a toothpick comes out clean. Cool in the pan for 10 minutes. Run a knife around edge of cake, invert cake onto a plate, and remove the parchment paper. Gently flip cake back over onto a cooling rack. 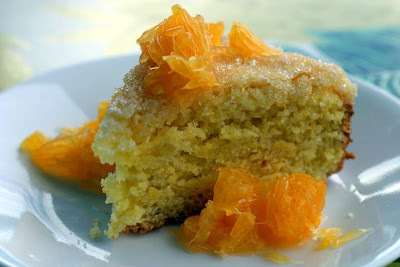 Cool completely and serve with orange segments.